My Hyperion 1 is operating intermittently, why? The Hyperion 1 uses radio signals to transmit information from the sensor to the remote control. These radio signals can be interrupted if there are large, dense objects such as metal, lead doors or stone between the sensor and the remote control. Moving the remote control closer to the sensor in the grow room usually takes care of the problem. The remote control will continue to send signals to the sensor until the sensor accepts the signal and begins to control your garden. How does the lighting controller work? The lighting controller functions using lighting systems that are driven by 'trigger cord sets'. The trigger cord is plugged into the 'LIGHT OUTPUT' receptacle. The Hyperion 1 can be set for a 12 hours ON time, 12 hours OFF time for flowering or 18 hours ON time and 6 hours OFF time for vegetative growth or CUSTOM schedule to fit any lighting needs a grower might desire. The Hyperion 1 will activate the lights when the pre-programmed schedule is activated and defeat the lighting system when the schedule ends via the trigger cords. What is the 'Bulb Odometer' function? This is an icon on the LCD that notifies the grower when their grow bulb is reaching the end of its useful life. The bulb loses intensity and your crop will show it over a period of time by yellowing or poor performance compared to prior crops in the same situation. 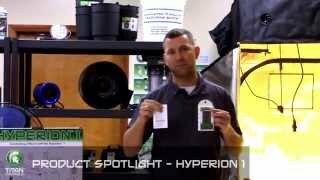 Grow bulbs should be replaced regularly and the Hyperion 1 provides a helpful reminder to keep your crops growing well.